They're arrogant and usually have an opinion on every issue. When they're wrong, they get defensive. These people never offer ideas or let you know where they stand. They bully and intimidate. They're constantly demanding and brutally critical. Is anything ever right with them? They prefer complaining to finding solutions. They agree to any commitment, yet rarely deliver. You can't trust them to follow through. They are quick to point out why something won't work. Worse, they're inflexible. Never again fall victim to those who love to make life miserable for the rest of us. 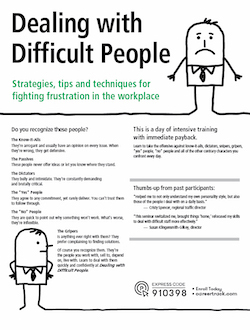 This training gives you concrete techniques for dealing with difficult people in the workplace and at home. It provides specific strategies for getting adversaries to cooperate … bullies to back off … wallflowers to open up … chronic complainers to quiet down. Knowing how to deal with difficult people at work will allow you to approach your job with more enjoyment and your coworkers with greater confidence. Cooperation, collaboration and compromise will improve — and that makes for a more productive and efficient workplace for everyone. Learn how they think, what they fear, why they do what they do. Understanding these things makes dealing with difficult people less frustrating. At this seminar, you'll concentrate on here's-how-you-do-it techniques. You'll leave knowing how to use these techniques in specific situations when dealing with difficult people in the workplace. Look at the difficult people in your life. Chances are, at least one person manages to get along with them. You can, too. Learn how to derail problem people and teach them to treat you with respect. Let's face it, nobody's difficult all the time (and everybody is some of the time). Your new skills will help you reinforce positive behavior in even the most difficult people — at work and at home. How to handle someone who wants to get "too personal"